1. I must go back to Paris before I die. 2. You can’t stop me. 3. I wish I never had to buy Frontline for the dogs again. 4. My friend Gaylen has helped me change my life. 5. I know the song Mercedes Benz by Janis Joplin by heart. 6. If I weren’t so afraid, I would do something I’m afraid of . 7. And as for the weekend, tonight I’m looking forward to dinner with a friend, tomorrow my plans include maybe going to see my cousin and friend Pat and Sunday, I want to make a pot roast! Questions this week are courtesy of Heather from It’s All About The Hat! Thanks, Heather! I went to see the movie 4 Christmases today…eh. I’d wait for the video if I were you all! Then I went to visit Dad, and afterwards met a friend for dinner … we had cheese fondue and for dessert, chocolate fondue. I was pretty damn good though, I must say! She’s right in the middle, between Skelly on the left and Sakura on the right…and so far, she’s nameless…got any ideas for me? Well, you have a Skelly, and a Sakura, both “esses” and both thematically appropriate, so… How about Sangria? I would like to see Paris before I die but I want to see Ireland first. And I love your answer to #6! Glad your dad’s doing better, Janet! I want to come over for the pot roast!! Having your Dad doing better is a wonderful Christmas present. I am glad to hear that your father is improving. OK, I somehow got bumped out of my comment. I am so glad that your dad is able to talk again. What a relief! I love your new poppet. She has a skull balloon? Her dress is a most lovely shade of red, so I was thinking of a name that played on that. Scarlett’s a little obvious and not very Japanese sounding. So glad to hear the good news about your dad. I pray that his recovery continues and is speedy! Love the new addition. You scored! As death heavy as she is I keep thinking of very unlikely names that are just the opposite of how she looks…like Phyllis. So glad for the dad. how cute! I’m glad your dad is feeling better, as always, keeping positive thoughts! I got a poppet for Christmas too!! Glad to hear the news about your Dad. I like Scarlett, but thought it might be clever to use the Japanese version of it … when I tried BabelFish it just gave the characters of the word and not the phonetic … boo. For a totally random alternate, how about Mathilde? LOL I promise I won’t try to stop you! Go back to Paris? Heck I just want to go TO Paris. LOL #6 way to commit! I’m so glad that your dad has improved! Congrats on the new addition to your poppet family. Glad to hear your dad is doing better. Your little poppet is cute! 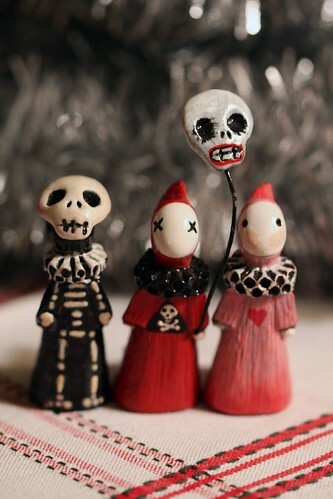 What a neat collection, I love dia de las muertas. I wish that Frontline wasn’t so darn expensive, but it does work well, hey? Happy New Year! I’m glad about your dad, too – oh yeah, Janis Joplin! She should be named Shadow of course, it suits her perfectly. So glad to hear that your dad is doing better. Yay about your dad. I like the name Shadow too. and i’ll be right over. i love pot roast. 1. )Glad you hear about your dad. I’d like to see Paris even once! yay for your dad being better!!! glad you had a good holiday weekend. stockings are so much fun. So glad to hear your dad is doing better…that is good news.